Downtown Contemporary Arts Festival (D-CAF)’s first edition is full of world class works by artists from Egypt, the Arab world and the world, taking place in various venues and spaces in downtown Cairo from the 29th of March to the 14th of April 2012. It’s the Cairo’s biggest international cultural event since the 25th of January revolution. 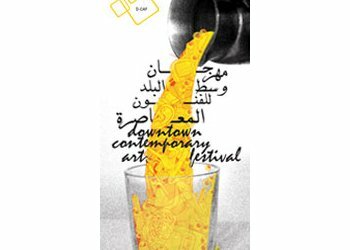 Downtown Contemporary Arts Festival (D-CAF), Egypt’s first-ever international multi-disciplinary contemporary arts festival, will take place over two weeks from March 29th to April 14th 2012 at multiple sites in downtown Cairo. This festival of contemporary arts will include local, regional and international music, theater, dance,visual arts and film by cutting-edge artists from Egypt, Europe, and beyond. Ninty-three artists will come from abroad to mingle with ninety local artists throughout the D-CAF program. In addition to featuring established downtown cultural spaces and theaters (the Townhouse Gallery, the Goethe Institute, the Falaky Theatre), D-CAF will break new ground by using non-traditional spaces such as Cinema Radio, the old Vienoise hotel, alleyways and galleries, as sites for performance, events, workshops and installations, to engage audiences with the city and new ways of expression. With its internationally diverse and high-quality programming, D-CAF aspires to become one of the most important annual Arab art events in the region, reaching out to a broad spectrum international curators and programmers, and capitalizing on downtown Cairo’s recent recognition as a unique cultural, social and architectural center. The Downtown Contemporary Arts Festival (D-CAF) is an independent initiative launched by a group of Egypt’s most established and well-known artists, curators and cultural operators, whose collective knowledge, experience and international contacts in the contemporary art scene ensures the highest standard of presentation and production for the festival. The D-CAF team is working in collaboration with some of downtown Cairo’s most important cultural institutions, such as the [ Studio Emad Eddin -Foundation >287] (SEE Foundation), Townhouse Gallery, CIC (Contemporary Image Collective), Falaki Theatre among the others. D-CAF also is supported by a plethora of international cultural centers, corporate sponsors, local private companies, international foundations, Embassies and cultural organizations who understand the importance of supporting and exposing new outlets of expression to young Egyptians.